I’ve got some Neenah Classic Crest cardstock on order, after hearing it so highly praised by several stampers who recommended it here. In the meantime, I’m still playing around with the white cardstock/paper I’ve got on hand. Forrestwife mentioned in a comment that type of ink can make a difference in how an image stamps on a particular paper and this is a fair point. So I decided to try using one stamp (this time from Gotcha Images) to stamp on three different papers: Kromecoat glossy coated cardstock, Strathmore Premium Cover cardstock (Ultimate White) and Canson Cold Press Watercolor paper. The inks I used included: Ancient Page archival ink, ColorBox pigment ink, Distress Ink, ColorBox Fluid Chalk ink, StazOn solvent ink, VersaFine archival pigment ink, Brilliance archival pigment ink, Antiquities pigment ink and Ranger Archival ink. I didn’t have black ink in all of these colors (and black isn’t the only type of ink we use anyway!) so this time, the ink I used is mostly red, pink or plum. 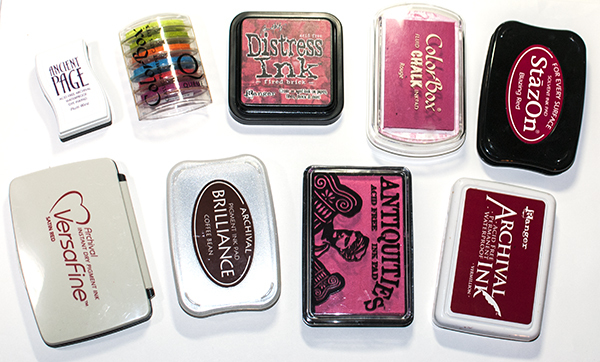 You may recognize the card on the right from the most recent eArticle, “Sponge & Brush Techniques for Stampers”. On the left is a second take on the card that I created today using the same stamp images and the same basic color scheme. 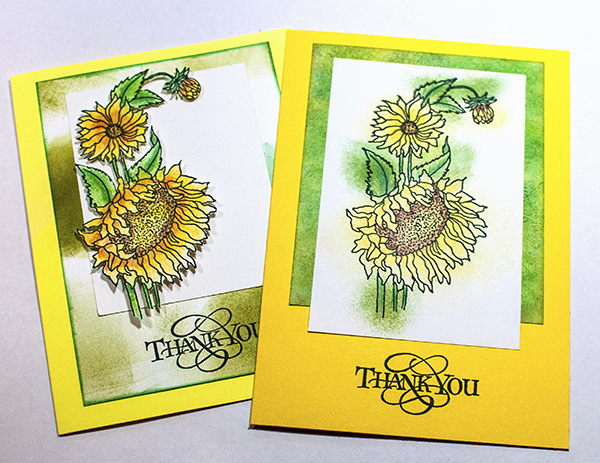 Both cards used stippled ink from an inkpad for the base color on the stamped flower. But there are some differences . . . 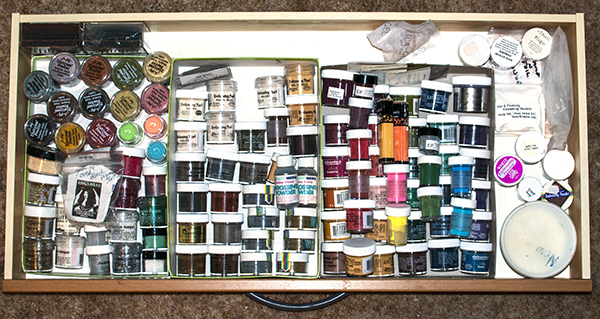 If you remember my recent post on “My Stamp Supplies Storage”, I showed you the inside of the drawers where I store most of my embossing powders and inkpads. I needed to do some surgery on the drawers (see “Fixing the Stamp Supply Drawers” post) and so had to take everything out of the drawers yesterday. When I put them back in today, I made some changes to how I arranged things.